The IRS official site has information on filing federal taxes along with quick links for common forms and instructions. The site is also available in Spanish, Chinese, Korean, Vietnamese and Russian. Federal forms can be ordered by telephone at 1-800-829-3676. The Colorado tax site has links to state forms along with information on filing, paying and receiving refunds. Colorado state forms can be ordered by telephone at 303-238-7378. *Note: Arapahoe Libraries receives limited quantities of paper tax forms. Forms and instructions can be printed from public computers (10 cents per page). Library staff are unable to offer tax advice. Tax Help Colorado offers FREE tax preparation assistance to low income families and individuals. Services are available in English, Spanish and Hindi at various tax sites in the Denver metro area. To find a location near you and verify language availability, visit the website. All DABC Free Tax Super Sites prepare and e-file basic federal and State of Colorado income tax returns FREE of charge for low income families and individuals. Services are available in English and Spanish. No appointment necessary. Visit the website for locations and operating hours. VITA (Volunteer Income Tax Assistance) and TCE (Tax Counseling for the Elderly) offer FREE preparation and e-filing of Federal and Colorado State income taxes for low income taxpayers and the elderly. Visit the website for a list of locations and what to expect. Qualified taxpayers can prepare their own taxes online for FREE with telephone and chat support from trained volunteers 12 pm–12 am MST Monday through Friday and 2 pm–11 pm MST on Saturdays. AARP Foundation Tax-Aide offers free tax preparation help to moderate–low income taxpayers, especially those 50 and older. 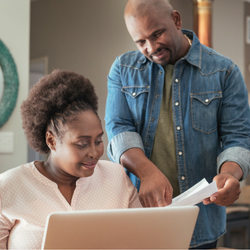 Check the website for local sites near you in addition to helpful articles and information about money management and taxes. The IRS offers free e-filing of federal returns for taxpayers with adjusted gross incomes under $64,000. The Free File fillable forms are also available to all taxpayers for use in lieu of paper forms. AARP Tax Assistance Sessionsopens a new window, geared toward taxpayers who are low income or ages 60 and older, are available at the library February through April. Registration begins in January and classes fill up fast.